Ford just made a big commitment to Apple CarPlay. 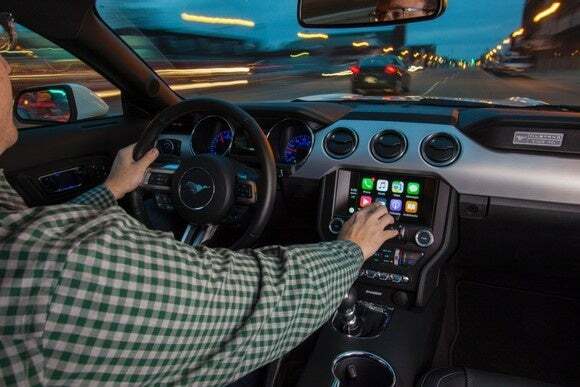 The company announced Monday that all 2017 models equipped with its SYNC 3 infotainment system will come with the ability to run Apple's phone-to-car interface. With CarPlay enabled, anyone running an iPhone 5 or later can connect their phone to their vehicle dashboard for displaying directions, using phone functions, listening to music, and accessing Siri. When we looked at CarPlay for iOS 9.3 in April, we especially liked the overhauled version of Apple Music that includes the New and For You sections, as well as Maps’ Nearby feature. Some of Ford’s 2017 lineup is already available, including the Escape small SUV, the larger Explorer SUV, the Fusion sedan, and the Mustang performance car. Other popular Ford vehicles, including the Edge crossover, the F-150 pickup truck, the Focus compact car, and the Super Duty pickup will roll out their CarPlay-capable 2017 models before the end of 2016. Ford's long been in the forefront of connected-car technology, pioneering the SYNC infotainment system (originally in partnership with Microsoft) long before most drivers—and arguably, most of the technology—was truly ready for it. The company introduced SYNC 3 late last year with major improvements. The company also announced Android Auto compatibility on Monday. Why this matters: We first heard about Ford’s triple personality during CES in January when Ford was showing off the SYNC 3 platform in standard mode, or with the auto interfaces for iOS and Android. The big news here, however, is that every 2017 consumer-grade vehicle is rolling out with the capability. Prior to this only select models came with SYNC 3. Note that While CarPlay will help you with entertainment and navigation, standard vehicle information and controls such as climate controls remain firmly part of SYNC 3.